I love travel writing. I love anthologies. Great Tours and Detours is introduced (on the cover) as 'Modern Grand Tours in the company of some of the world's greatest writers'. Can you see me salivating? Guess again. This is the worst travel book I have ever read. As I understand, the book is a collection of articles printed previously in The New York Times. Perhaps logically, NYT supplied most of the authors ('world's greatest authors'? I don't think so. Let's not mix mass media with literature, shall we?). Well, Great Tours and Detours certainly reads like a string of magazine travel features, complete with - and this is probably my biggest pain - hotel addresses, price lists and museum opening hours. What is perfectly suitable for a newspaper becomes absurd when published in hardback. Hint: the book came out in 1986. You wouldn't get too far today if you based your travelling budget on its tips. With a few notable exceptions (e.g. Jan Morris ), the articles are rather uninspiring. Target customer: a loaded tourist with conventional tastes. The editors (A. M. Rosenthal and Arthur Gelb) call it sophistication, I call it snobbism. Let me put it like this: I'll never understand people who, when asked to describe a country, write about its fancy hotels. 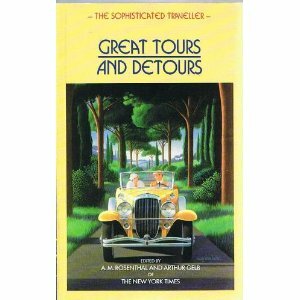 Verdict: Great Tours and Detours is a travel guide, very pleasant one, but outdated by some three decades. It is not a book of travel writing, howgh.